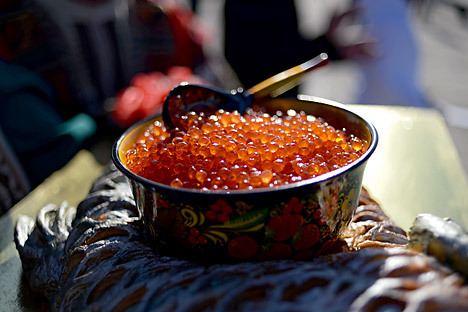 Caviar and sturgeon are renowned brands of the Astrakhan region. The caviar production in the southern Russian region of Astrakhan has increased 14 times to ten tons over the period of five years, along with sturgeon production growing 1.7 times, the regional government’s press service said. "Fish production in the Astrakhan region has grown by 9 percent, sturgeon production has increased 1.7 times, caviar production has risen 14 times. At present, annual sturgeon production is 400 tons and yearly caviar output has reached ten tons," the press service added. Throughout the region, there are 18 sturgeon breeding facilities with a total area of 70 square kilometers. Yet the companies have an opportunity to significantly increase fish and caviar production by utilizing the intensified methods. In addition, fish farming ponds have also been developing, along with attempts having been made to produce tropical shellfish, sharptooth catfish and predatory fish species. Caviar and sturgeon are renowned brands of the Astrakhan region, and their production is at present only available in Russia by local companies. Astrakhan’s fish processing factories produce caviar by pressing the fish eggs out through microscopic incisions so the fish stay alive and can breed again in a few years. The production growth is based on forming the sturgeon broodstock. Russia’s Ministry of Agriculture reported earlier that in 2015 the fish capture in the region had grown by 13 percent to about 43,500 tons, while the total fish production had increased by ten percent. Besides that, the regional fish-breeding companies produced over ten tonnes of fish. The level of fishery products supplied to the region’s residents constitutes 160 percent.